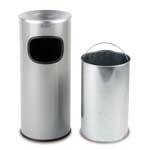 Dual purpose stainless steel and black bins for cigarette ash and general waste. 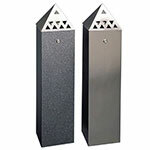 Pyramid topped cigarette bins with inner collection tray to reduce smoke and odour emissions. 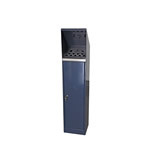 Can be post or wall mounted, features a drop down front for ease of emptying. 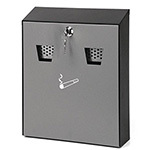 In these days of ubiquitous smoking bans in indoor settings, including workplaces, staff and customers alike have taken to smoking in designated areas. The last thing you need for the general appearance of your premises is an area of ground littered with used cigarette butts and ash. 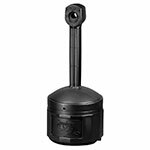 At ESE Direct, we supply a durable and stylish range of external cigarette bins, outdoor ashbins and wall cigarette bins. 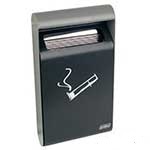 All these bins are specially designed to combat the problems associated with employees or visitors smoking. 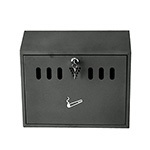 Our combined wall-mounted cigarette bin with ashtray is made from galvanised steel coated in dark grey polyester. 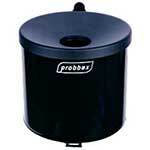 Most of our ashtrays are suitable for both indoor and outdoor use. 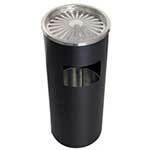 The simple, stylish wall-mounted cigarette bin with its sloping top for weathering is made from heavy duty steel. 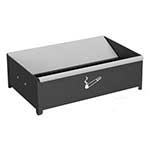 It comes in a stainless steel or epoxy finish. 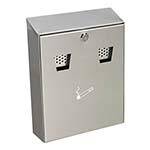 We also have a strong range of affordable freestanding cigarette bins, these bins are ideal for placement at office doors, in parks and many other locations. Now that most workplaces have their own designated smoking areas, there is a huge need to fit them out properly. Making sure you have adequate seating, shelter and waste disposal on hand is vital. 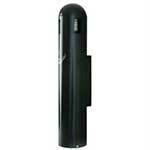 Outdoor smoking shelters need to make provision for the disposal of cigarette butts and other rubbish. Of you have a shelter that backs onto an existing brick building, a wall mounted bin will be suitable. 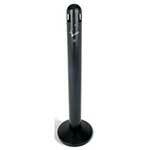 If there is no suitable surface to fix anything to, then look at our range of free standing cigarette bins. 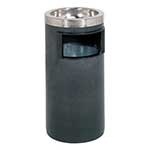 All our ash bins are, or course, fire resistant,as they are required to house the still lit remnants of smoking materials. Care must be taken when emptying butts and ash collected in case they are still hot.